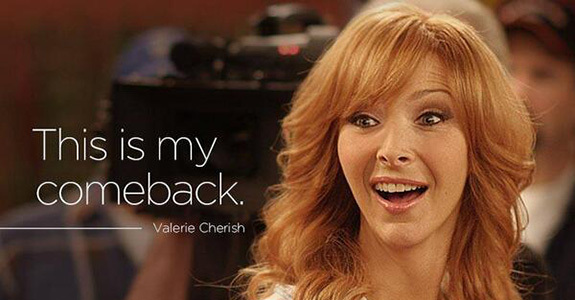 HBO‘s The Comeback (with the one and only Valerie Cherish–played to sheer perfection by Lisa Kudrow) was one of those shows from the early oughts that was so on-the-nose about everything that was would eventually come, television wise, that it completely flew over everyone’s heads–straight into the skies of cancelled cult classics. Except–as was the case for Arrested Development–the benevolent rulers over cable television have finally seen the light–bringing our beloved Valerie back to us for six brand-new episodes kicking off on November 9th … she is finally getting another (and much deserved) take after all nine long years–justice is finally about to be served up. PS Yes, it’s true PopBytes owns the domain valeriecherish.com–we desperately tried to save the show back in 2005 when it was cancelled after just one season … we are now being heard!